THE HAGUE: The governing centre-right coalition in the Netherlands has lost its senate majority after a populist party surged in provincial elections. The anti-immigration Forum for Democracy is set to win most votes and have as many seats in the upper house as Prime Minister Mark Rutte’s party. The election came two days after a suspected terror attack in Utrecht. Addressing supporters, party leader Thierry Baudet bitterly criticised Mr Rutte’s immigration policies. “Successive Rutte governments have left our borders wide open, letting in hundreds of thousands of people with cultures completely different to ours,” he told the cheering crowd. Mr Baudet, who was criticised for continuing to campaign after Monday’s shooting on a tram, said Dutch people were being “destroyed by the people who are supposed to be protecting us”. Analysts say he may team up with the anti-Islam Freedom Party, led by far-right politician Geert Wilders. With about 94% of the vote counted, Forum for Democracy is believed to have won the most votes. Forum for Democracy had no seats in the current 75-seat upper house. It is now set to have 12. Mr Rutte will now need the support of other parties beyond his own coalition to pass legislation. The 38 seats previously held by his coalition will now fall to 31. Mr Rutte told his supporters they were “going to have to get to work”. “We have to talk with other parties so we can continue to lead this country well,” he said. 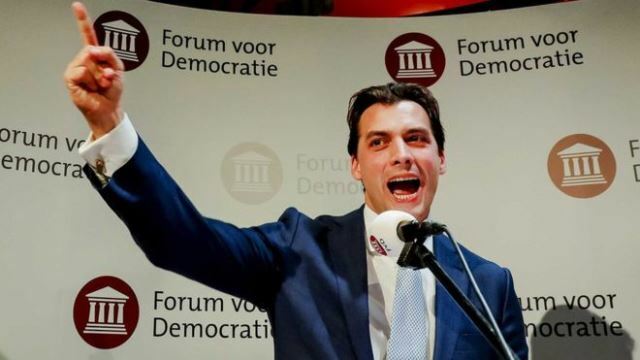 While most politicians halted their campaigns in the immediate aftermath of Monday’s attack on a tram in Utrecht, Mr Baudet continued and blamed it on the government’s immigration policies. Three people were killed and three others seriously wounded and the chief suspect, Turkish born Gokmen Tanis, remains in custody. On Wednesday, prosecutors said a letter found in the gunman’s getaway car was among the reasons why a terrorist motive was being considered.